It's officially Spring and it's time to clean! I'm working on cleaning out all my old and unused makeup this week. 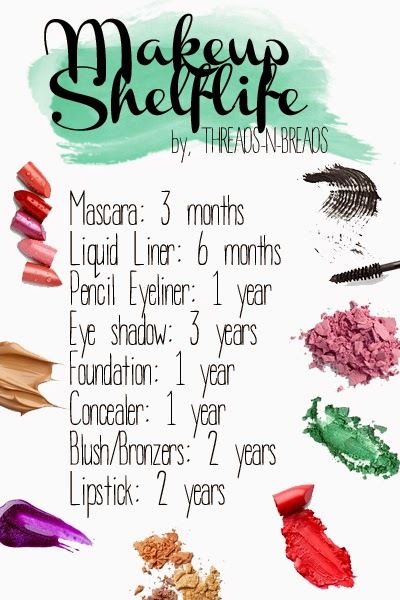 Pin this image below for a handy guide on Makeup Shelf-life. When do you need to let it go and toss it? It's important to consistently toss old makeup because bacteria can grow and that's no good for your health. When it comes to products that come into contact with your eye - these have the shortest makeup shelf life because lingering bacteria can cause redness or itchiness. Mascara - Since the brush is taken out, applied, and then put back into the tube, bacteria can be collected along the way. This is the main product you should be replacing every 3 months. I recommend buying the smaller travel sized mascaras that are available instead of the full size to encourage replacing this product regularly and saving a bit of money. Liquid Liner - Like mascara, this is applied and then put back into the tube, so since the eye is a sensitive area, this product should be replaced almost as frequently as mascara - between 3-6 months. Pencil Eyeliner - This type of product can last a bit longer since it is easier to clean. If you can sharpen, the product can last up to 1 year, but it may dry out by then. you can also use alcohol to sanitize the tip of the pencil after application to prevent bacteria growth. Eye Shadow - As long as you clean your brushes regularly, you can prolong the life your your eyeshadow. You can keep eye shadows for up to 3 years, just make sure it's sealed properly and you don't have broken packaging that could let dust in. It's important to make sure your face products are stored properly in the right temperature and can be sealed properly so that the formula doesn't dry out and lasts as long as possible. Foundation - This can last up to 1 year. Depending on the type of packaging that your foundation allows you to dispense, you want to avoid touching your fingers to the inside of the bottle. I prefer to use one with a pump like the make up forever HD foundation. Concealer - Same with this product, it's important to toss this after a year to prevent any bacteria from being applied to your face, especially to the under eye area. Depending on the packaging, you want to avoid touching your fingers directly to the inside of the container. Use a clean brush to pick up the product to apply to your face. Blush, Bronzer and Face Powders - these types of products can be extended to about 2 years of use since we tend to use multiple shades over the season so with proper clean brushes, these products can last a bit longer. Lipstick and Lipgloss - Lip products can last up to two years because of the type of ingredients it is made out of. It may be a good idea to avoid using your lip products when sick so you don't spread those sick germs to your products and then reapply later when you're healthy. 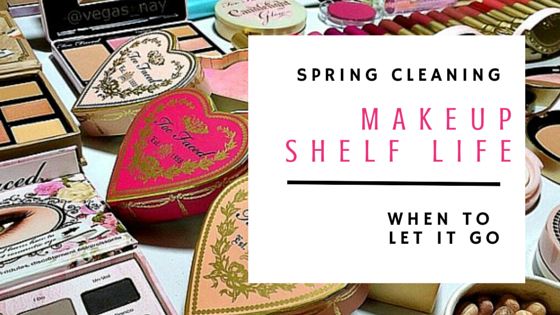 Don't forget to regularly clean your makeup brushes to extend your makeup shelf-life. See my how-to here.